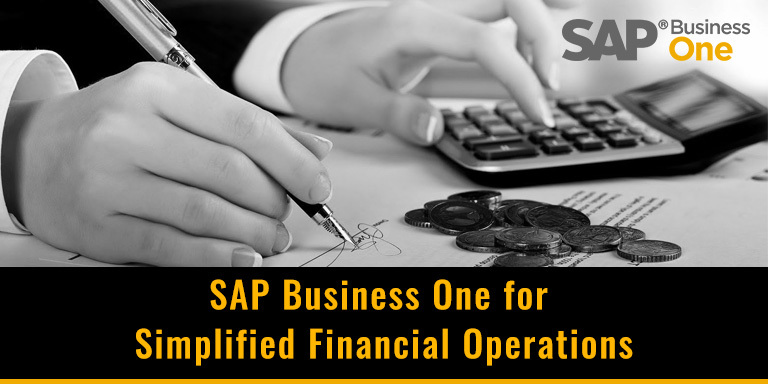 Why choose Sap Business One for Financial Management? As a business grows, so does the number of systems and processes involved in its day to day running. Financial management is one core area that can become more and more complex as a business evolves, and without suitable accounting software in place, it can impede business development. In this post, we discuss how the accounting features of SAP Business One help transform the financial management and to help enhance profit margin. SAP finance and accounting software(part of SAP Business One)can manage your business’s entire financial administration. All transnational data, including online banking tasks, can be consolidated seamlessly, enabling you to process payments and adjustments by card, cheque, or BACS transfer. This means that financial information from all your business transactions automatically flows into your accounts, producing a clear and definite reflection of your finances in real time. Less time is consumed settling accounts from disparate applications, for leaner and more dynamic financial management. This multi-channel integration can build a fresh and extensive perspective of your business as a whole. With the ability to monitor your accounts with real-time precision, SAP Business One can help you reveal new acumens into your financial performance and spot new opportunities for growth. The software empowers you to make possible cost-savings and strategic refinements with confidence. SAP’s accounting software is powerful and responsive. Able to accommodate the increasing needs of your growing business, the system makes it easy to generate custom accounting reports that include cash flow and performance tracking, accounts payable and receivable, and fixed assets. As a result, potentially time-consuming and laborious jobs such as month-end close are simplified and streamlined. The software eliminates the legwork of systematic accounting processes, even allowing you to assign specific tasks to select users or set up reminders to ensure a uniform procedure. With different taxation and compliance rules in effect in different countries, trading or even just sourcing overseas can feel a bit daunting. SAP Business One can help with its multi-currency capability. It allows you to practice any number of country-specific accounting and tax laws to your international dealings. You are unconstrained to expand globally knowing that SAP Business One meets the standards of compliance. Realistic business spending is only achievable when you can control your budgets against an actual picture of your accounts. With SAP’s accounting software, you can fix budgets for each of your expensesand filter them against your monthly and yearly business performance. Undoubtedly, the real essence of the financial data processed by SAP Business One is only fully unlocked when it is probed. The reporting capability lets you drill down through the real-time accounting data to make profit-driven business decisions. Why choose Silver Touch for SAP Business One? When you partner with us on SAP Business One, your business will benefit from our market-leading knowledge of the software, a customised approach to your business and on-going 24/7 customer support. We understand everything about SAP Business One, so you can be certain you’ll get the best to make the most of your investment. Contact us today on +44 – (0) 203-872-5140 or email at info@silvertouchtech.co.uk to find out more.